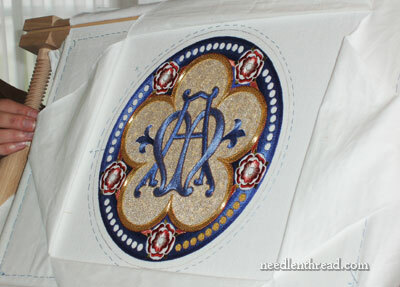 Goldwork Embroidery: Never Ending, but So Worth It! When last we visited the Medallion Project, we discussed stretching pearl purl for the outline around the inside of the medallion. Since then (it seems ages ago! ), I’ve finally finished the goldwork around the cinquefoil (five-petal shape) on the inside of the medallion and have started adding the gold to the Tudor-style roses. These days, it seems as if the goldwork is never-ending! 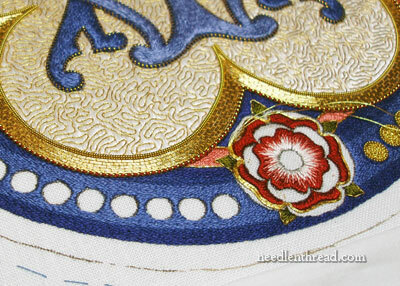 But the tediousness of the goldwork is extremely worthwhile, because it really enriches the whole project. Here you can see the size of the medallion in context again, so you can keep in mind the size of the project. It doesn’t look too big, does it? So why is it taking Soooooooo Loooooooooong?!?! 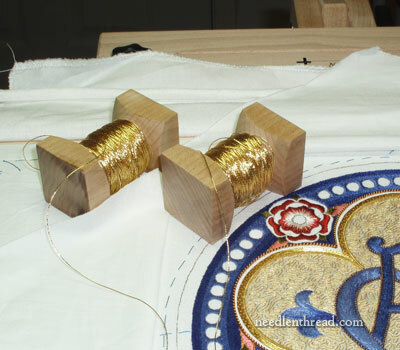 There are a few differences between working with Japanese gold thread and gold smooth passing thread. First, the Japanese gold thread is wound onto two koma, or spools, so that it’s easier to couch in pairs. The koma is rounded in the middle where the gold is wound, but square on the ends, so that it rests easily on the surface of your work, without rolling away. They’re a good tool to invest in, whether you’re working with Japanese gold or smooth passing thread in any quantity. If I’m working a large, continuous area of couching with smooth passing thread, I wind the stuff on the koma first, to make it easier. Second, this Japanese gold thread does not pinch and hold its pinch as well as smooth passing thread does. Smooth passing thread feels and operates a little more like wire, while Japanese gold is a bit softer and more pliable. So it’s actually harder to take really sharp corners with Japanese gold. Ye medallion from the side…. And a little closer up on the gold, with some of the gold going in on one of the roses. Don’t forget that I’m giving away a copy of Hazel Blomkamp’s book, Crewel Twists, so if you’d like to get in on that, visit the original post and follow the instructions! The give-away ends Monday morning. Hope you have a stupendously wonderful weekend! Hi Mary! Or should I say Ave!?! WOW–your medallion is a stunner. Your client will be in very good company upon completion of your project. A quick Google of “cinquefoil window” produces a lovely photo of a window at Lincoln Cathedral where the form is used with similar colors. Keep the classics coming! Gorgeous work Mary…wish I could stitch like you….some day! This is the first look you’ve given us of the entire medallion and it was definitely worth the wait. I’d love to hold it in my hand and admire the thread & stitching. Mary, it looks stunning. The recipient is going to love it. Thank you for sharing such a beautiful (and involved!) project. It is so beautiful! Wow! Thank you so much for continuing to share your beautiful works of art with us. It is so inspiring! What exquisite work! The recipient is truly lucky. I am so in awe of this beautiful project every time you show it to us and I am even more in awe of the that it has been embroidered by some one I “know” (a very loose definition as you are an internet friend”)……the fact that we have seen your gorgeous stitching from the beginning and watched it “appear” on our screen is really an honor. Thank you so much for your continual inspiration, even though the Medallion is way beyond my skills!!!!!! Yes, definitely, the goldwork is so worthwhile. It really adds a wonderful quality to the piece. I think you’ve carefully chosen just the right amount of goldwork overall, enough to move the observer and make a statement that this is an important piece of art, without being overwhelming or gaudy. A quietly celebratory feel just right for a worship service. Whoa! I was going to say that they better be paying you well. But, I don’t think the amount could ever pay for all you’ve put into it, no matter how much it was. that’s not meant to be disrespectful to your client but as a reminder of all that has gone into this project. $ Just somehow can’t compensate for that. It is taking sooooo looooonng for us to have time to admire your work !! It is so beautiful. I am sure that the photos do not give so much credit to your work. going to go to the Container Store this afternoon…lol. just a looksee trip. That goldwork is just exquisite! It’s beautiful, I would love to be able to do that. But I’m guessing I’d start with something easier and smaller. Oh, gorgeous! I might even say: breath-taking! That gold work is so luxuriant and shiny! Thanks for the perspective shot, too. Awesome work, Mary!! That goldwork looks exquisite. Well, it all does, but from only a little distance it looks like a solid gold bezel, doesn’t it? A work of art, to be sure. Seriously divine and stunning Mary! Mary, it’s stunning! I just love the look of couched Japanese thread and it really sets this piece off. You have a really good balance between color and gold. It’s very rich looking. Your work is always exquisite and worth the time it takes! Absolutely glorious! What a wonderful thing to see – and best of all we have been able to see every step along the way. 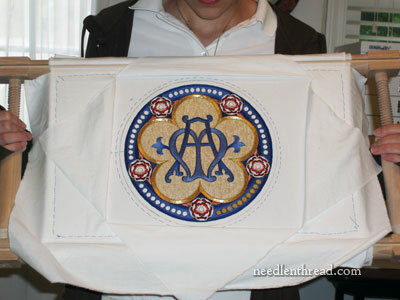 Many thanks and congratulations on this wonderful example of ecclesiastical embroidery. That medallion is so beautiful! Your work is exquisite. Talent combined with an eye for color combines to produce a beautiful piece of work that you should be proud of. This is looking stunning. I like how you’ve managed to balance the colors and design so that it has a effect from a distance, but still does not look coarse up close. This is absolutely gorgeous, Mary! Like so many others, I have enjoyed every post about this project from the beginning. Thank you so much for sharing it. The pink looks wonderful with all the areas filled (After all the comments, I just had to see how it turned out. )Maybe it’s the lighting, but the gold around the cinquefoil really seems to make it pop! Absolutely gorgeous. Its beauty brings tears to my eyes. Simply wonderful! Absolutely stunning. It was so interesting to see this piece coming together. Hi Mary, I LOVE this project and admire that you’ve kept up with it so well I probably would have procrastinated and put it off. ANYwho…lol, I was just curious what you intended to use this piece for once finished? Do you intended to frame it? I think that would be the best option it’s just so gorgeous! Keep up the good work. Oh Mary! The Medallion is Beautiful! When did you get the confidence to take on that level of embroidery? I get nervous just looking at the speciality threads and big designs. What is a good starting project for the silk and gold threads? How will I know I’m ready to take on that kind of project? Oh my……. Absolutely exquisite. You’re a true artist. I have smooth bamboo rods that are meant to be made into bamboo pens for calligraphy. I wind *any* metal thread I intend to couch onto these. (No worries with snagging – the bamboo is totally smooth). Why are komas so dratted expensive? Anyway, you imply that passing thread doesn’t need to be wound like that, yes? I find it so much easier – the thread just ‘winds out’ smoothly as the rod rolls. You can see the advantage with the Koma – it would roll more smoothly because the edge are raised, and the actual thread is away from the surface the Koma is resting on. Mine is a bit of a quick and dirty fix, using the bamboo – but definitely much easier than trying to couch from a skein/loop of whichever thread. That’s such a great point about Jap Thread not holding a pinch so well! A good reason to choose a passing thread over Jap Thread for a project. Thankyou. Did I mention that this is stunning! I guess it takes so long because of the multitude of ‘complicated’ stitches. Stitching that needs extra attention and decisions that have to be made after each section so ‘the whole’ flows aesthetically. Each problem solved causes another to become imminent. As in painting, it’s all about problem solving and problem making and solving and… each colour and tone added causes a visual reaction to the previous application, for better or worse, and needs to be evaluated at each step, and so it goes. Not that any to this would be news to you! And, it takes so long because you take pride in your work and won’t accept 2nd best. Bless you Mary, you’re always so positive and encouraging, and you must have ‘bad’ days at times. Take care of yourself and keep up this very special ‘work’ you’re doing for all of us. May you always benefit from it especially. What flows onto us is an amazing and much appreciated bonus. This project is so special that the mind boggles for adjectives to describe it. Good on you Mary, Cheers, Kath. Stunning already! I can’t imagine how lovely it will be when it is completed. This is truly inspiring, artistic, professional, beautiful work, aaaaamaaaazzzzziiiinnnnnggggg. Question: How did you manage to get the goldwork points in the cinquefoil frame so fine? Could you show us a close-up? How does one take a sharp corner with the pearl purl, on the inside edge, and the wrapped pearl purl on the outside edge of the quinque foil? Does the purl stay in one piece, and one just bends it at the corner? I think I understand about plunging the Japanese gold thread at the corner points, but a close up of the corner would be so much appreciated to see how to handle the entire thing! Such beautiful work! Thank you so much for sharing and teaching all of us. That medallion is very gorgeous ! a very work of artist !! You are right. It is SO worth it ! There is no substitute for “Patience” when you know the finished product is going to be Magnificent ! Well Done ! Such stunning work! I love seeing the progress, thank you for sharing it (and all the techniques) with us. Next Next post: Crewel Twists Winner!